An attractive warmer with a deliciously fragranced, wax bar melting within is the heart of the Scentsy story. In 2004 during a significant downswing in his entrepreneurial journey Orville Thompson manned a booth at a Salt Lake City home show selling game controllers to try to make ends meet. Encouraged by his wife Heidi to “swing for the fence” rather than turn his back on building his own company he diligently sold his product over the course of a few days as he became familiar with a wickless candle concept offered by the vendors selling across from him at the event. Orville brought a warmer, wax and scent testers from his home show neighbors back to his family. Heidi and her sister and mother immersed themselves in smelling the testers and enjoying the spreading aromas as the warmer and wax did their magic. The Thompsons found that the fragrances were so evocative, memories and emotions emerging of treasured past events, relationships, hopes and dreams as the scents were appreciated. As the family members reminisced under the influence of the homey and transcendent fragrances both Orville and Heidi realized the warmer and wax concept just might be the home run they had envisioned to invigorate their home business. They purchased the Scentsy company and began building a direct sale company that would make their mission statement a reality: To bring value to the world by providing an industry-leading, family-friendly business opportunity selling creative, artistic, high-quality products that Warm the Heart, Enliven the Senses, and Inspire the Soul. Inspired by the laughter, memories and feelings Orville observed as Heidi and her mother and sister bonded over the scents he delivered, Scentsy was launched through a simple and entertaining party plan concept. The Thompsons encouraged new consultants to bring family, neighbors and friends together to experience the swirl of enchanting fragrances and the fun and decorative possibilities of the lightbulb fueled warmers. Since that first fragrance festival in the Thompson kitchen Scentsy has grown and defined itself as one of the premier direct selling opportunities available today. 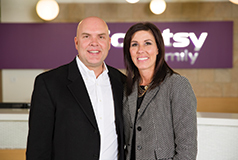 Emerging from the family sheep farm to become a major enterprise in the Boise, Idaho area Scentsy has supported its community and its consultants, blazing a path for other businesses intent upon transforming the world in constructive ways. Scentsy Commons, the company’s home base in Meridian, Idaho, showcases sustainable and energy efficient building methods and employee and community friendly features. As Scentsy has expanded additional distribution centers have been placed at strategic points in the US to meet the needs of consultants and customers. The first product pairing offered continues to be a touchstone for Scentsy — the flameless warmer and scented wax. Fanciful and fun, cute and contemporary, elegant and enduring, Scentsy warmers are available in a wide range of styles including college and sports themed warmers and seasonal concepts that melt the iconic Scentsy bars while decorating home or office. Coordinating room sprays, scent circles, car fresheners and travel tins round out the original collection. Diffusers, featuring natural and essential oils and oil blends, have joined the repertoire for those who prefer a more aromatherapeutic approach. Personal care items for men, women and kids keep the whole family clean and smelling great while laundry and kitchen products continue the Scentsy vibe throughout the house. Consultants and customers await the introduction of new Scentsy Buddies, kid centered toys that delight the entire family, carry a fragrant Scent Pak in their tummy, perfect for sweet snuggles and spirited play times. Central to the Scentsy spirit is its Family Foundation, the embodiment of Scentsy’s generosity, encouraging those in the Scentsy family to “contribute more than you take,” just as Scentsy supports those in need with scholarships and donations to various causes. Scentsy celebrates more than a decade of inspirational scents and exemplary business practices. It provides a great opportunity for individuals and families to grow their own business with a charming and captivating range of products everyone loves to buy, give and receive.